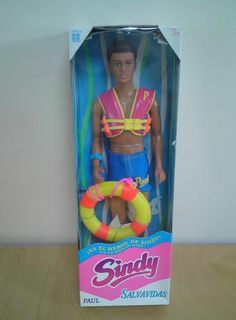 Seaside. 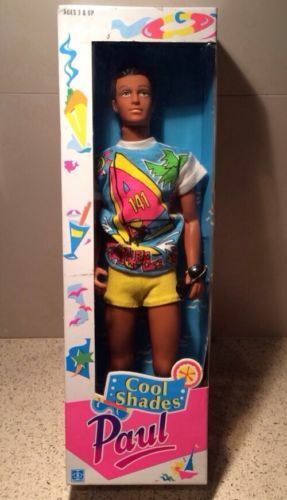 Red shorts and jacket, sandals, towel, camera, and sunglasses. 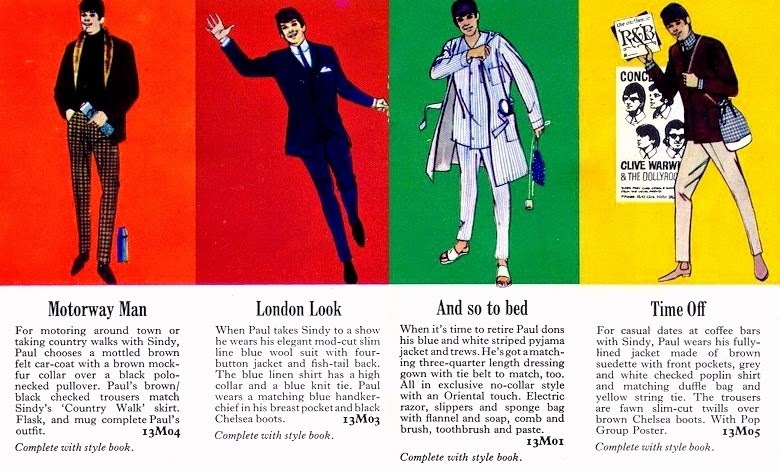 London Look. 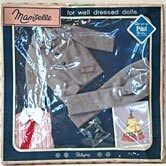 As pictured - boxed pic HERE. 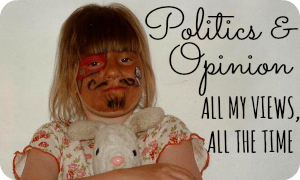 Time Off. Check shirt, beige trousers, tan jacket, chelsea boots, and a blue denim duffle bag. 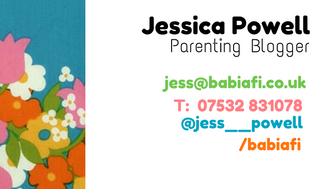 You can find the full booklets HERE. 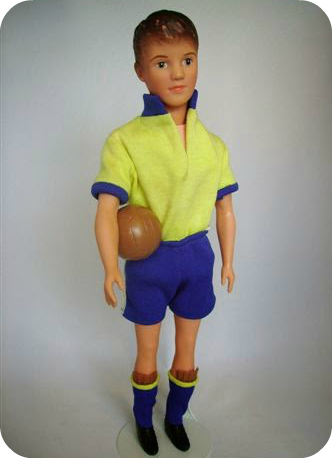 Soccer. 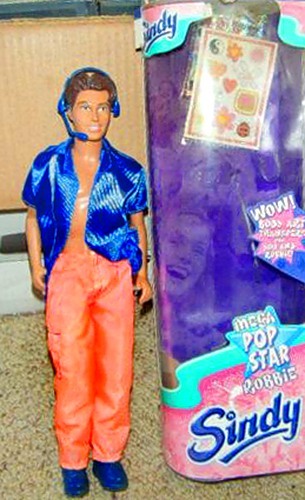 As pictured - boxed pic HERE. 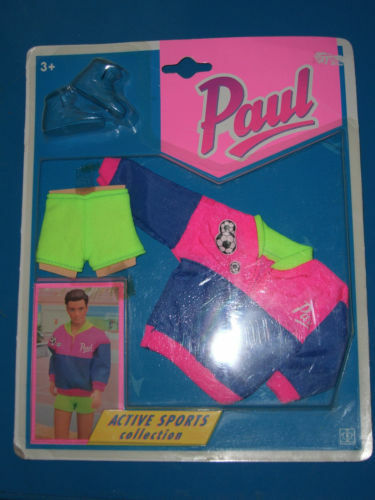 Winter Sports. 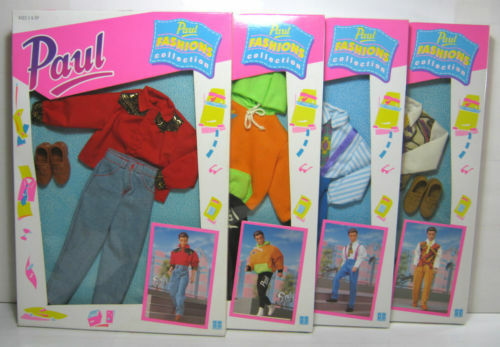 Blue ski pants, red knit jumper, bobble hat, gloves, skis, and skates. 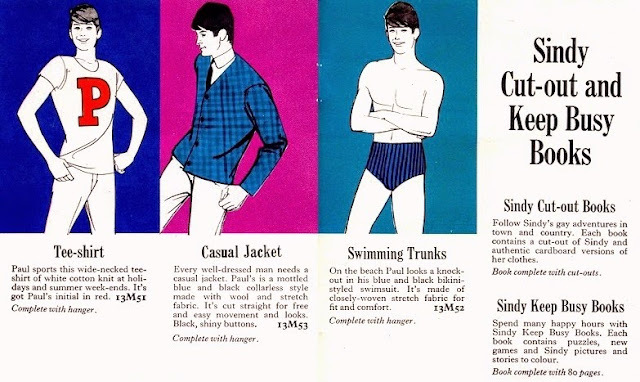 Group Gear. 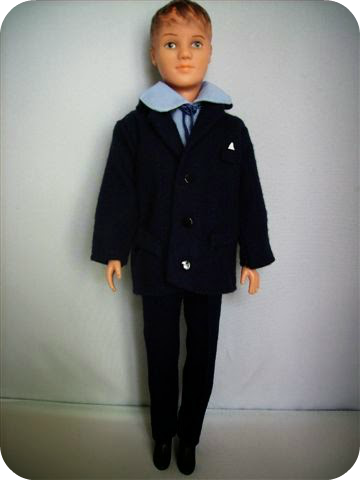 Black and white houndstooth Beatles' style suit with black chelsea boots and green plastic guitar. 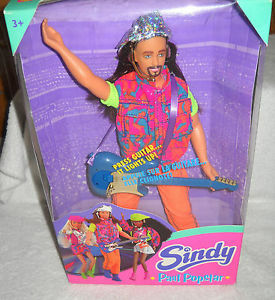 King of the Road. 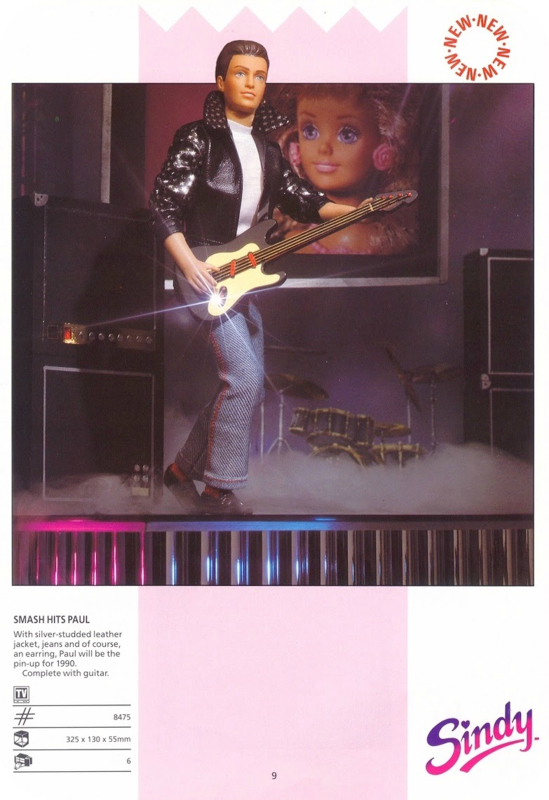 Black vinyl bomber jacket, black trousers, boots, and motorcycle helmet. 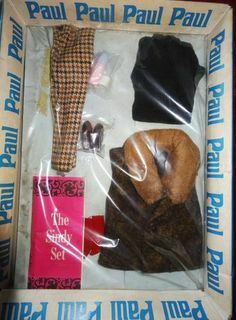 String Set. White mesh vest and Y-fronts, plus a Motor Sport magazine. Track Suit. All-in-one zip up red tracksuit. 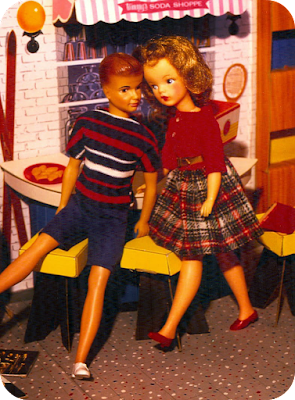 Tennis Party. 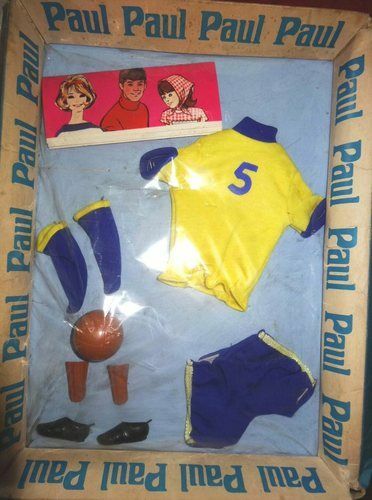 White polo shirt, shorts, jacket, socks and lace ups, plus a tennis racket and set of three tennis balls. 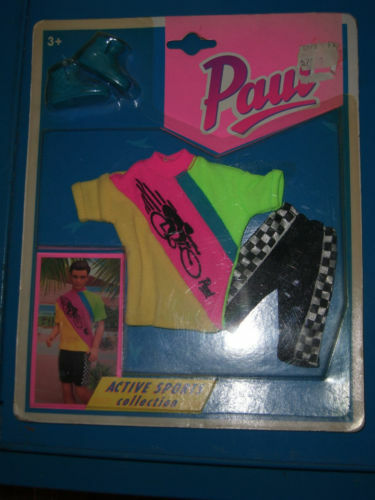 Paul's Scooter. 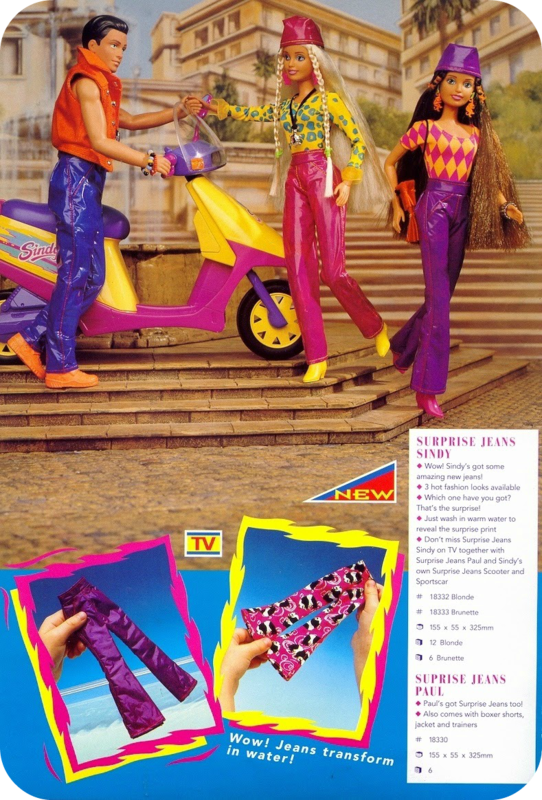 Lambretta style scooter which really 'worked' with the aid of two batteries. 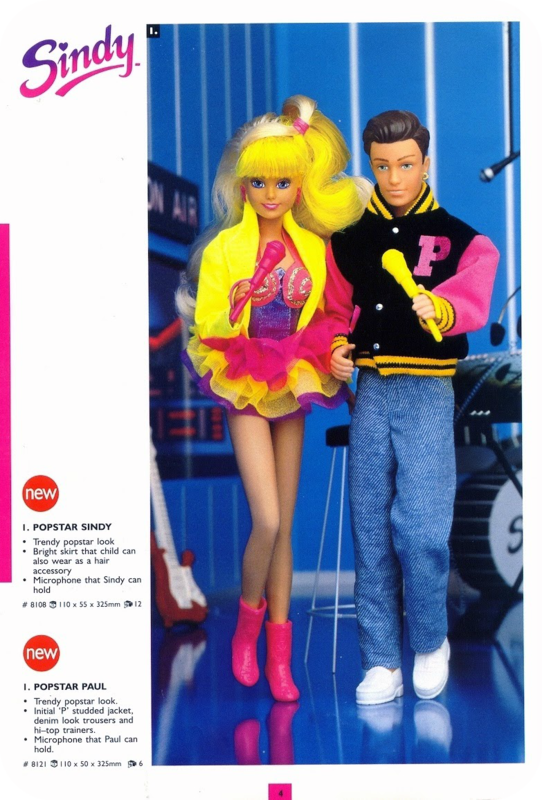 With Sindy being the standard size doll in the UK you could also get plenty of doll knitting patterns for her and the rest of the line - e.g. 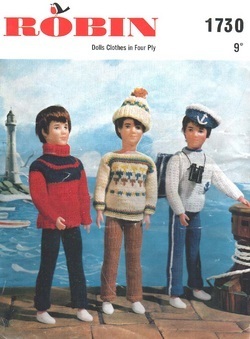 as in THIS pattern from Robin and THIS one from Patons. 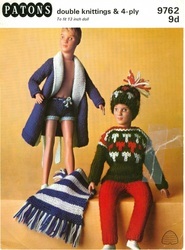 There's a whole website dedicated to Sindy knitting patterns, check it out HERE. 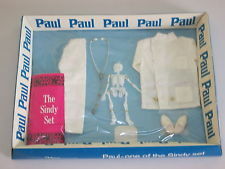 You could read about Paul in Sindy's Gift Books and annuals too, or in the series of Sindy Adventure Stories. 1986 was the year of the Royal Wedding, that is the wedding of Prince Andrew, Duke of York, to Sarah Ferguson. 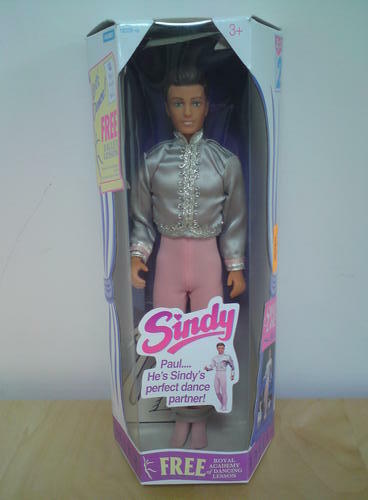 To cash in on the event Pedigree added a new male doll to the Sindy line, Mark. 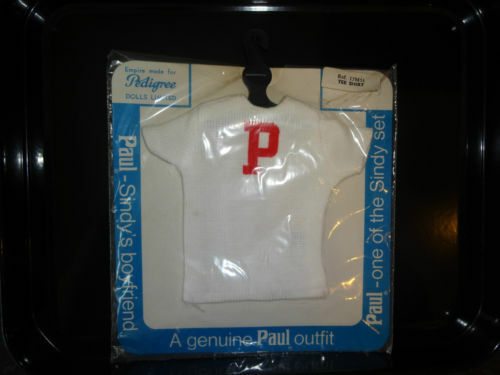 In addition to the Royal Wedding Mark and Marie double set, there was also a single version of Mark wearing white trousers, red mesh T-shirt, blue jacket and white sneakers - check him out HERE and HERE - plus a 'His 'N' Hers' fashion pack - see HERE. 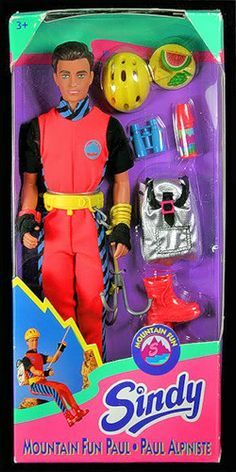 Jump into Action. 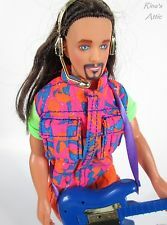 Red and blue tracksuit, white sneakers, and red gym bag. 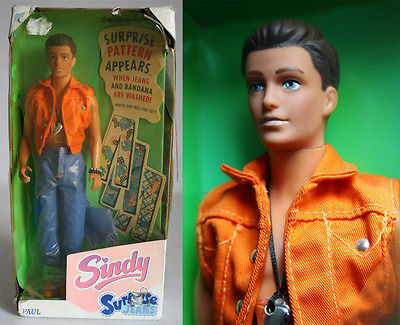 Dashing in Denim. 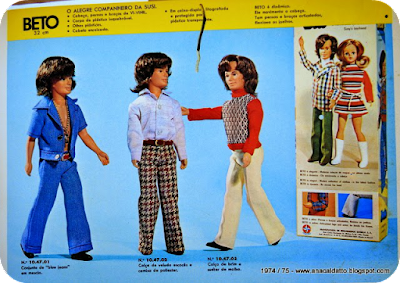 Dark blue jeans, white sneakers, blue shirt with yellow bow tie, and yellow cardigan. Special Night Out. 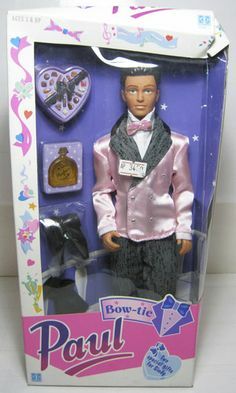 White dress shirt with black bow tie, light blue cummerbund, black trousers, black shoes, and white jacket. 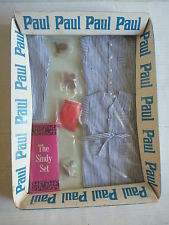 Paul had a bit of a haircut in 1988, something which he was mistakenly lead to believe made him 'super cool' (boxed pic HERE). 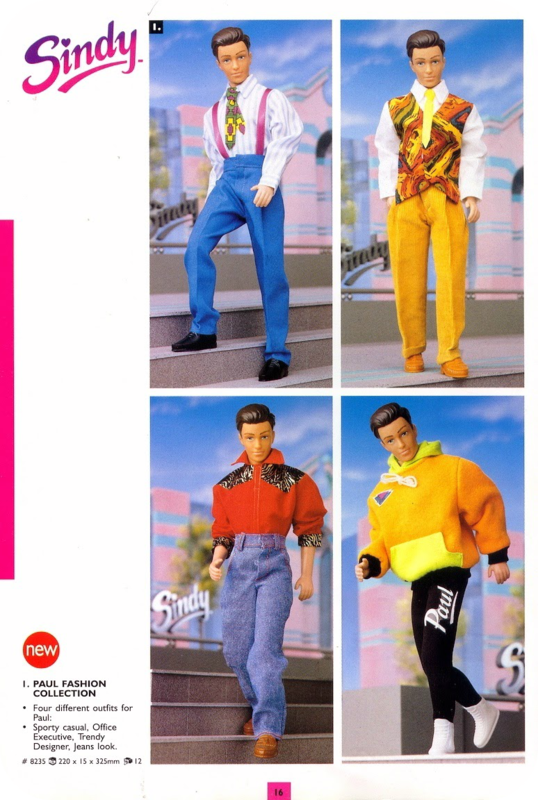 He didn't gain any new fashions, but his '87 releases were all still available - check out the updated catalogue photos HERE. 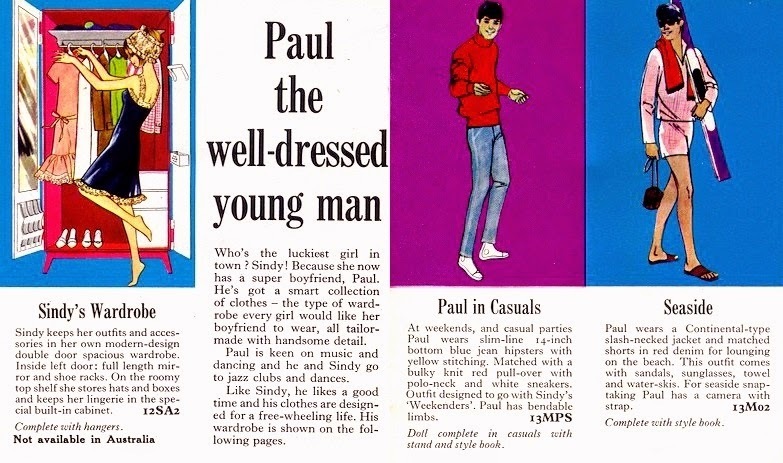 Paul really began to hit his stride in 1990. 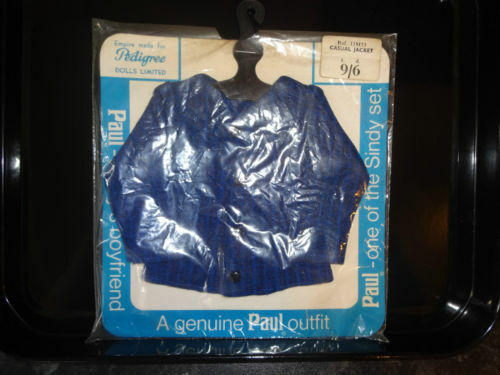 There were no Paul fashions that year, just two dressed dolls - Smash Hits Paul (boxed pic HERE) and Jet-Away Paul wearing the eye burning colours expected of the early 90s tourist. 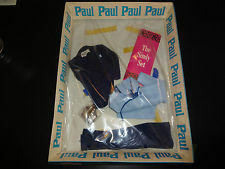 Jet-Away and Smash Hits Paul were still available in the 1991 catalogue, and they were joined by Bow Tie Paul (boxed pic HERE and TV ad HERE) and Dance Craze Paul who sported a pink plastic bum bag and a new side part hairstyle. 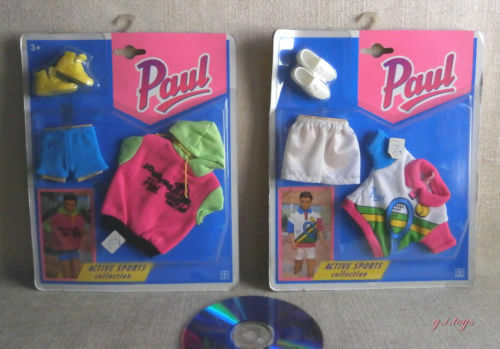 Paul also gained a fashion collection this year, Sportswear. New releases for 1993 were Romance Paul (pictured), and Holiday Paul. 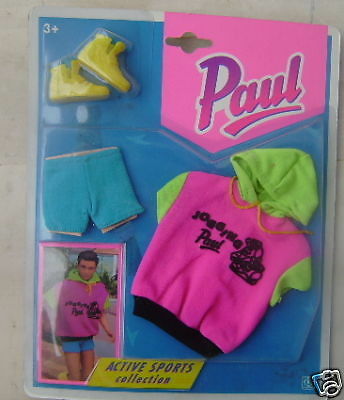 Paul also got a new Active Sportswear collection with outfits for cycling, football, jogging, and tennis. 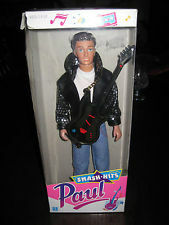 Popstar and Cool Shades Paul were still available, along with the T-shirts and the 1992 fashion packs. 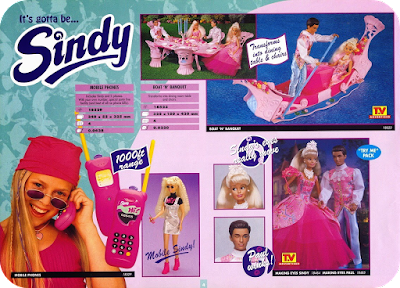 1994 had a bit of everything. 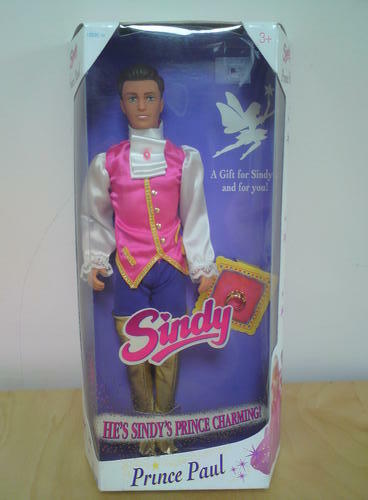 There was Surprise Jeans Paul (boxed pic HERE) with his funky colour change trousers - you can watch the TV ad HERE - and the dashing Prince Paul (boxed + TV ad) wearing an outfit capable of rivaling any of Ken's nylon monstrosities. 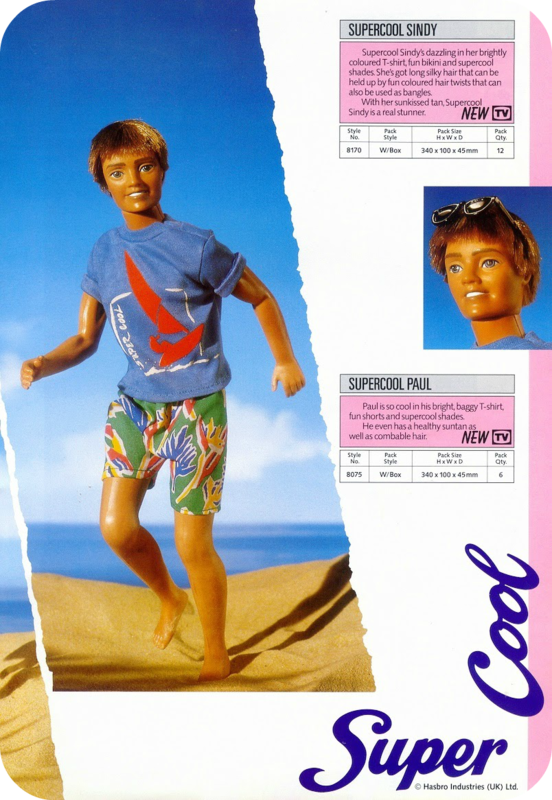 Lifeguard Paul (boxed + TV ad) tapped into the 90s Baywatch craze, while Swan Lake Paul (boxed) proved that some men weren't afraid to wear tights. The 1992 fashion collection was still available too. 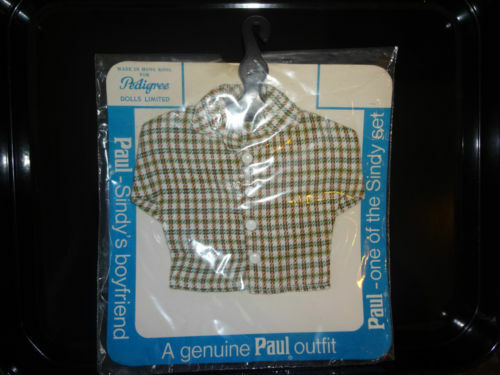 Sindy's new T-shirt collection included one with her boyfriend's face - see HERE - and the new talking Sindy couldn't stop going on about Paul's new haircut. 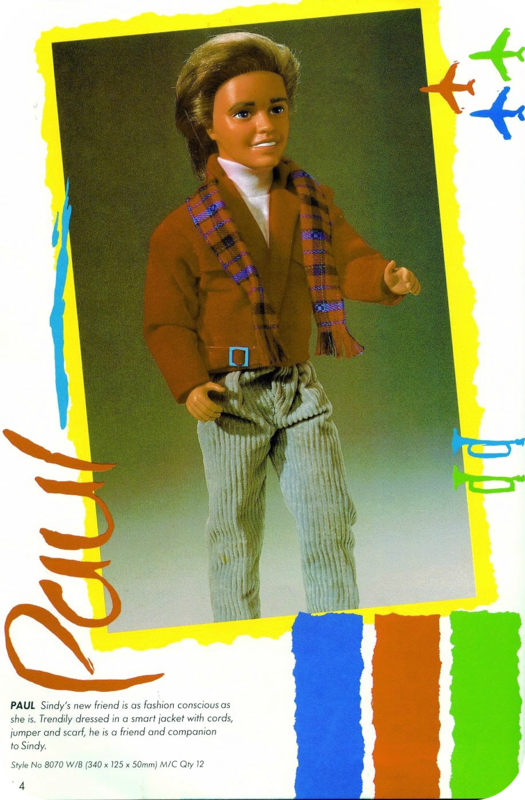 There were a whole range of all new Pauls available in 1995. 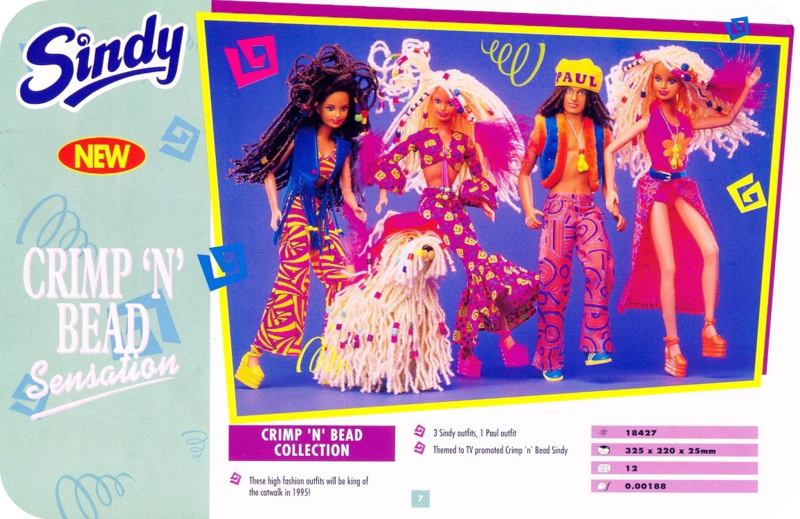 A long haired Paul (pictured) was released as part of the Crimp 'N' Bead collection. 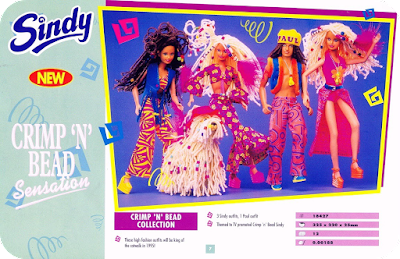 Another long haired doll, Summer Looks Paul (boxed), had a hippy vibe, while the sensibly cropped Mountain Fun Paul (boxed) complimented Climbing Sindy (TV ad for them both HERE), and her adventure 4x4 (TV ad). 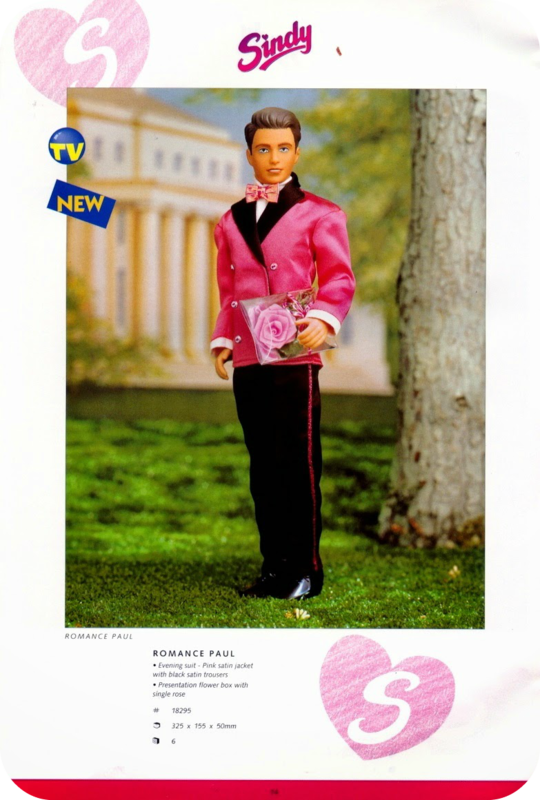 Finally there was I Love Glitter Paul (boxed + TV ad), who was advertised as being 'more romantic than ever'. 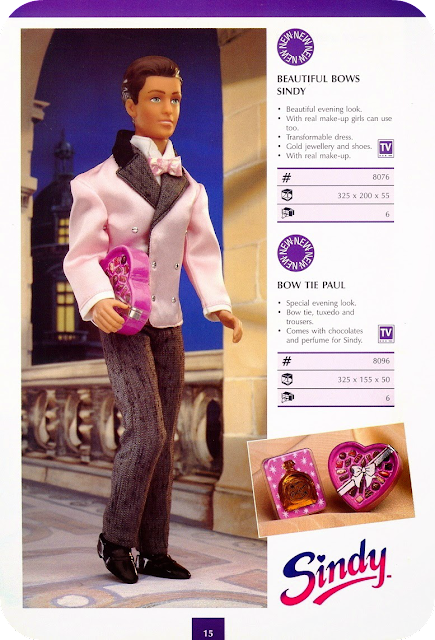 There was only one outfit available however, as part of the three pack Wedding Collection. 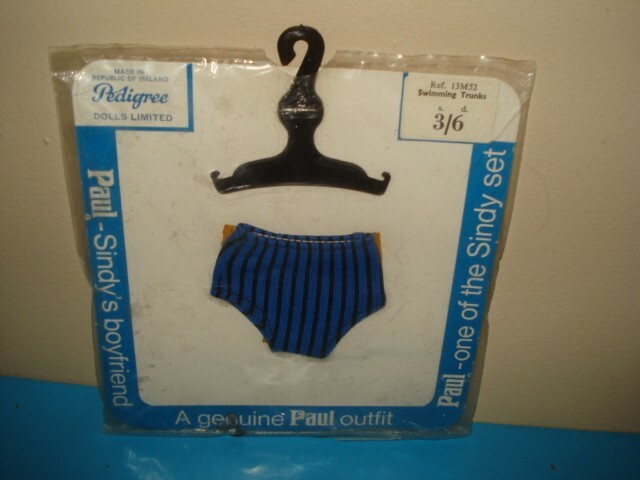 Not shown in the catalogue is Pop Star Paul (boxed). Hasbro were looking to get rid of the brand in '96 and the catalogue for that year only has one Paul doll, the pictured Making Eyes Paul (boxed). 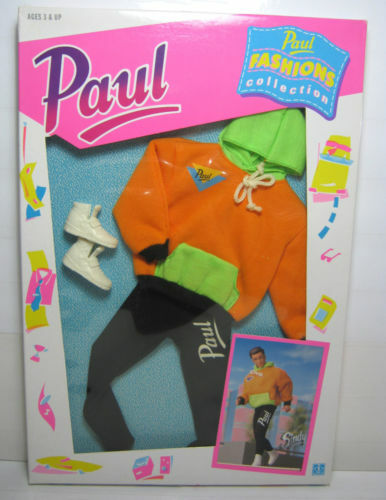 Nevertheless there is also Skater Paul whose box proclaims him to be from '96, click to see the FRONT and BACK of his box. 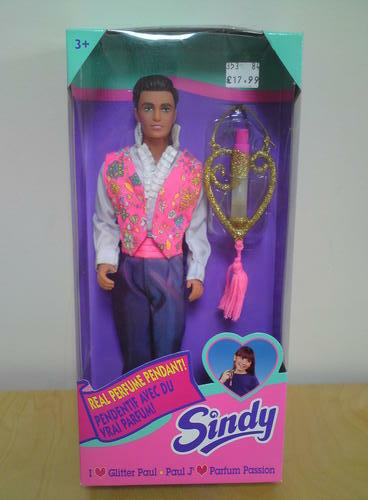 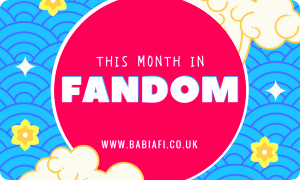 Vivid Imaginations began producing Sindy in 1999 and, though Paul didn't make the new line up, they did have a male doll - Mega Pop Star Robbie (boxed). Bibi-bo was the Greek version of Sindy, first produced in around 1981 by El Greco. 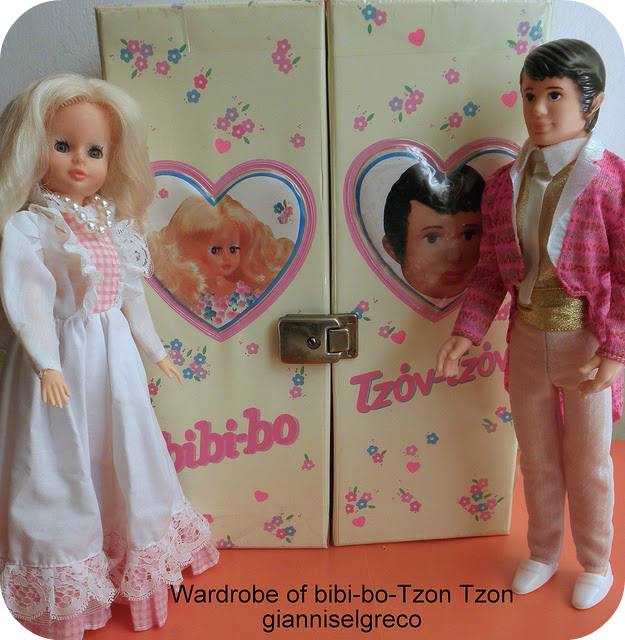 Her boyfriend, Tzon-Tzon, came along a few years later - there's a boxed example HERE. 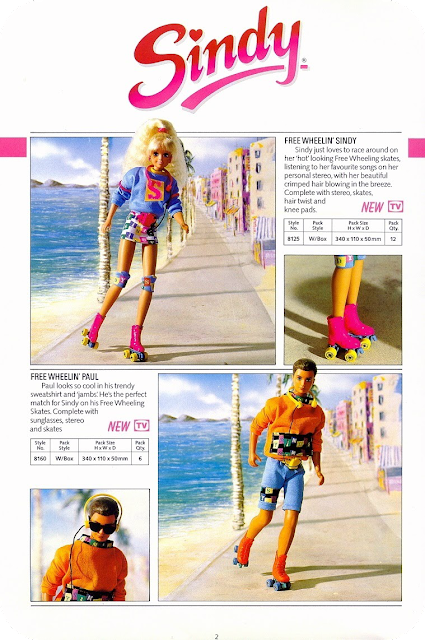 El Greco was eventually bought out by Hasbro in 1990, and the Bibi-bo line was discontinued soon after. 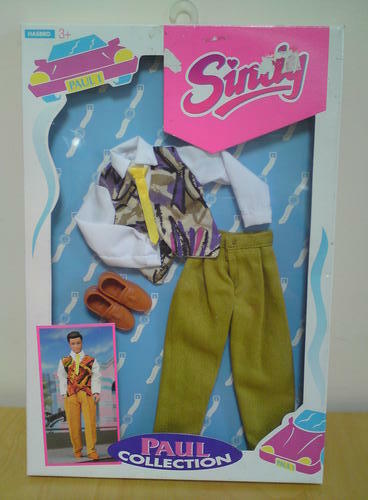 Fleur is generally billed as Sindy's Dutch cousin or, less kindly, as a Sindy clone - Otto Simon first produced the doll in 1978, just after Pedigree made the decision not to renew their Sindy licence... In 1987 she gained a boyfriend, Danny, but he was gone by 1988 - read more about him HERE. 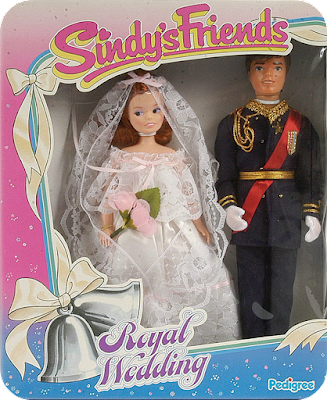 Susi doll began life as a Sindy clone produced by Estrela for the Brazilian market in 1966. 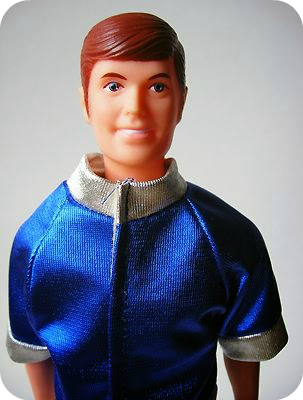 Beto, her boyfriend and Ken lookalike, joined the line in 1974 for a few years, and was later reintroduced in the 2000s. 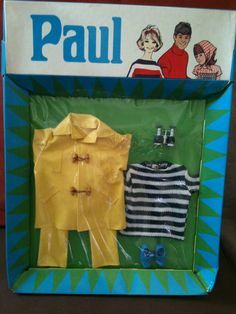 Love reading the history of the Paul doll! 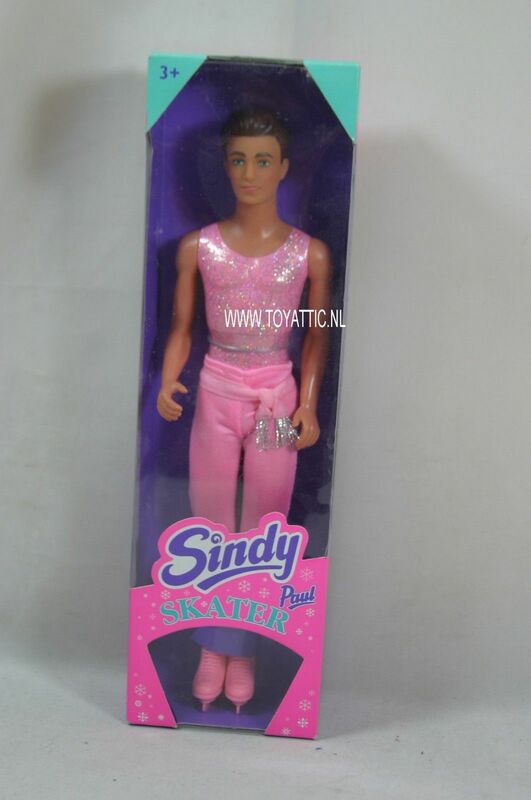 Although I am from the USA I LOVE the Sindy and Paul doll! Tammy's a favorite too! 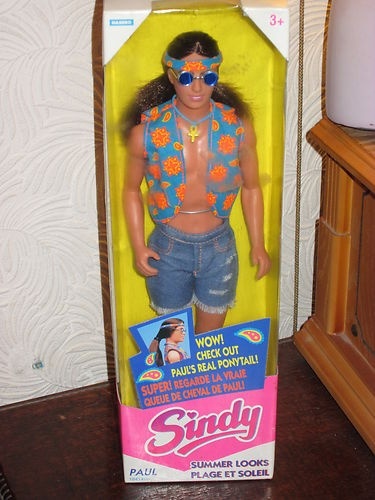 I have all the tammy dolls except for her boyfriend, Bud, who like you wrote looks like her brother, Ted! lol. 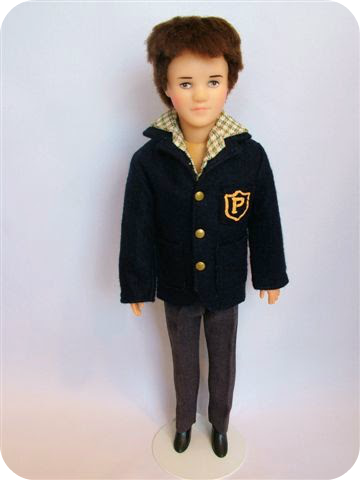 Ted is so much harder to find on the auction block today!